The Dai Nippon Butoku Kai came to existence by the urgent call of those noble men with the ardent desire to bring back the glorious tradition of Japanese martial culture in 19th century. It was a private nature in the first initiative and brought forth the involvement of greater societal force of its time. The imperial authority, police force, military institutions, Shinto institution, and local and national government cooperated with the leaders in the martial profession to have created the most powerful Budo society in the world. Its aim was exclusively focused on restoration of classical Budo tradition, licensing credentials, honors, awards and recognitions, All Japan Butoku Sai operation, research and publication of Budo culture, education and cultivation of leaders and populace in martial arts world. The DNBK in the prewar times, having over three million members with huge physical assets backed by highest government authority commanded the supreme leadership in all accounts of Budo field. As a result, tens of thousands of expert instructors in the specialized field were recognized beyond their family linage. It became indisputably the legitimate national body of highest authority of martial arts of Japan and the world. The inevitable fate of this powerful Budo society was destined to face the historical tragedy that its highest nobility was exploited by the military institutions for their political and ideological campaign during the critical national urgency in war times. It essentially lost the sight of original private nature and was reduced to the control under the arm of military groups. As a result, in 1946 after the WWII, GHQ inevitably forced DNBK the ultimate organizational self-dissolution and later faced the compulsive dissolution and expulsion of all officials in addition to the elimination of physical assets. Until Japan regained her sovereignty in 1951 after San Francisco Peace Treaty, it took more years of enduring patience before it was reorganized again in 1953 by handful of still loyal survivors who desired to reestablish the new life of DNBK under new democratic national polity. 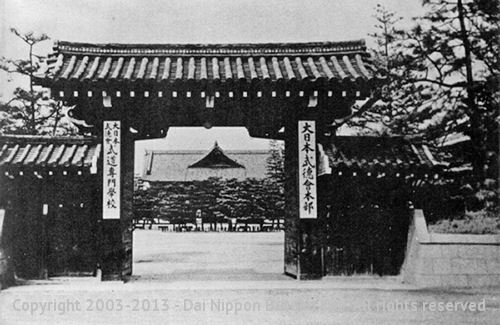 Although DNBK never had any intention of opening the gate to the international world, since 1965, the seed of new charted course of including the US members, and later having the gate of admission to the qualified international members in 1992, it has had a profound impact to the world of Budo since then. It was a vision of embracing the Budo spirit with a new charter and new energy toward restoring the original intent of Butoku virtues as it was intended a century ago. In this section, reader will be able to observe the glimpse of physical and spiritual energy of the DNBK of today and its lasting commitment to the future. In 8th century Japan, the ruling aristocratic class recognized the presence of powerful military class of Bushi Samurai ( warrior class ) for maintaining their fief territory. Under the supreme authority of Emperor Kanmu, to promote martial chivalry and military excellence, the Butoku Den ( Hall of Martial Virtues ) was established 794 A.D in the medieval capitol city of Kyoto. It was to encourage the Samurai warriors to develop their greater military prowess. They say that May 5th of 818 A.D. by the imperial order of Emperor Saga, the Yabusame ceremony ( Archery on Horseback ) was conducted in honor of the warriors' tradition to promote aristocratic authority of the imperial majesty in the Butoku Den located near Heian Shrine in Kyoto, Japan. Since then, Butoku Den became the primary center of all martial arts training throughout the history of Japan. From the late 9th century, the rise of fighting men with military and martial skills began to dominate the fate of Japanese history. They are called Bushi, ( Warrior Class ) and the Samurai was one such class of men serving mainly for the aristocratic nobility. They trained in Tachiuchi ( swordsmanship), Sojutsu ( Spear Art ), Naginatajutsu ( Halberd ) Kyuba no Michi the way of horsemanship and bow and arrow, and other cognate martial disciplines of warfare. Bushi warrior class in Genpei period of 12th century excelled not only in Bujutsu but also became known as men of high moral weight and ethical conduct. They were abided by unwritten Bushido code that was greater than any canons of institutional governance. Bushido, has made the lasting impact to the nobility for the next thousand years. In feudal Japan from the late 14th century to early 19th century, they developed complex combative forms using numerous types of weapons, armors, and various instruments of warfare. Many Ryuha Bujutsu ( Martial Arts Schools based on Particular Systems) has extensively evolved emphasizing their unique combative strategies, methods, theories, and applications. The Samurai warriors as ruling nobles by virtue of their professional and lifelong commitment had dedicated their lives on developing such superior martial skills and the cult of military excellence. The manifold Heiho ( Martial Strategy ) systems embodying complex weaponry art forms and bare armed combative skills were developed during the proliferation of internal warfare, Sengoku Jidai ( Period of Nations at War) from 15th century to early 17th century Japan. In the decisive battle of Sekigahara in 1600 A.D., the Tokugawa military clans destroyed the Toyotomi allied troops and as a result of this decisive battle, ending the internal strife between the feudal lords, the powerful Shogun military feudal government called Bakufu was established in Edo, present day Tokyo. Under the Bakufu regime, Japanese warrior class faithfully maintained the traditional order of martial disciplines for critical readiness for the next two hundred sixty years. The Bushi (warrior class, often called Samurai ) was not only the champion of societal elite for their military skills but also they epitomized the exemplary moral leadership by living under the code of Bushido ethics which they relentlessly adhered. The precepts of Tokugawa Bushido ( the Way of the Warrior ) coded by Buke Sho Hatto, Laws and Governance of Bushi that was more strictly instituted than the previous historical time. It stressed absolute obedience of warriors to the code of conduct and the way of life based on the virtues of honor, uncompromising loyalty, courage, duty, filial piety, sacrifice, integrity, discipline, compassion and incomparable fighting spirit. With this powerfully instituted frame of mind, Bushi had sharpened the way of the sword and other cognate military disciplines. During the Tokugawa period until mid 1800 A.D., the diversified martial arts schools were evolved to claim their supremacy in the military prowess. Traditional Bujutsu such as Kenjutsu, Gekikenjutsu, Heiho, Iaijutsu, Battojutsu, Naginatajutsu, Kogusokujutsu, Jujutsu, Kyujutsu, Bajutsu, Sojutsu, Hojutsu and various weaponry skills were extensively developed under the expert practitioners in the field of endeavors. Bushi was constantly reminded that the way of the warriors were to serve the lord with highest honor both in battle and everyday life. Martial readiness was his way of demonstrating his ultimate sacrifice. Under the external pressures came from foreign powers in late 19th century, Tokugawa Yoshinobu, the last Shogun, while facing the political pressure of powerful lord of Satsuma, Tosa and Choshu Samurai clans finally had abdicated his political power to the imperial throne. This was a result of inept Bakufu leadership led by Tokugawa regime for centuries. The political urgency and international pressures driven by Black Ships from America and other European nations awakened the young Samurai leaders of three major clans to urge for new nation building under the imperial monarchy. This was the beginning of the Meiji Restoration of 1867. With concerted political efforts of new Samurai leaders of Satsuma, Tosa and Choshu, Japan embarked on a new nation building to catch up with the west and to develop a recognized position of military and political power in the international community. In the tumultuous historical process, the traditional martial culture and its philosophical tenets became important instruments of the national ideology. After Meiji restoration, in 1867 Haito Rei(law of abolition of carrying the sword) was issued to altercate the social order by eliminating the privilege of Samurai class. Since then the practice of Geki-Ken became popular act in public demonstration amongst some of the Kenjutsu practitioners for their economic survival. However, the Seinan no Eki, War of 1877 which took place in Kagoshima prefecture by the retainer Samurai of Takemori Saigo changed the perspective of once dominated Kenjutsu art. The special forces of Batto Tai (Iai and Battojutsu) comprised of Tokyo Police Special Division fought furiously and bravely with their swords and gave significant damages to Saigo's once invincible Samurai forces. This notoriety afforded the sudden popularity and renewed energy and need for serious Kendo training. Other factor was Sino-Japanese War against Shing Dynasty of China. International instability in Asia necessitated Japan to develop critical readiness of the army for her national defense. In 1895, on the historic occasion of Kyoto city's 1100th anniversary of imperial capital enthroned by Emperor Kanmu, Heian Shrine was to be rebuilt with additional structures during the auspicious festivity. Emperor Kanmu originally built the old Butokuden to encourage the aristocratic warriors to polish his martial skills and spirit in 794 AD. Then, the Governor of Kyoto, Chiaki Watanabe, Duke and priest of Heian Shrine, M. Minobu and Kyoto prefecture treasurer, H. Torikai and Chief of the Kyoto police force , Kumataro Sassa, and Police Captain Takamichi Tanaka became organizational promoter of the unprecedented proposal of creating the national Budo society, called the Dai Nippon Butoku Kai. It started out as the national Budo exhibition event for being observed by his majesty Emperor Meiji. However, its purpose shifted toward the national level of Budo organization outlined in the following main objectives: 1. organizing annual Butoku Sai 2. establishing the Budo specialist school for education , leadership, and licensing 3. Recognitions of Budo practitioners 4. Preservation of traditional Bujitsu 5. Research and publication on classical weapons and Bujutsu. Thus, in 1895, The Dai Nippon Butoku Kai ( Greater Japan Martial Virtue Society ) was established in Kyoto Japan under the supporting authority of the national government and the endorsement of Meiji Emperor to solidify, promote, and standardize all martial disciplines and systems extant in Japan. It was the first official martial arts institution and premier governing body of Japan sanctioned by greater authority than mere traditional Budo linage. The Imperial Prince Komatsunomiya Akihito Shinno, Commander of the Imperial Army had served as the first Supreme Chair, of Sosai of the Dai Nippon Butoku Kai. Consequently, DNBK became the most prestigious headquarters endowed by the nation's leading experts in all disciplines of martial arts, and established as the center for training, research, licensing, and publication of martial arts. It was the year Japan defeated Shing dynasty of China in Sino-Japan war in 1895 and consequently, the urgency of Bujutsu training became a central focus of the Japanese government at that time. In 1899, the Butokuden was rebuilt again in Kyoto to become the place for the center of national attention restoring ancient glory and highest status for every martial art practitioner. In 1911, Bujutsu Senmon Gakko (Busen) (Martial Arts Professional School) was established within a framework of Dai Nippon Butoku Kai to administer national accreditation, certification and professional training of all martial arts disciplines throughout Japan. By 1930, National Government Record on Martial Arts Profile showed more than two and half million Black Belt holders, and more than twenty five thousand high-ranking experts registered in the eight major martial disciplines. DNBK faced the most tumultuous period of history where its organization was destined to become the supporting arm to justify the national interest. 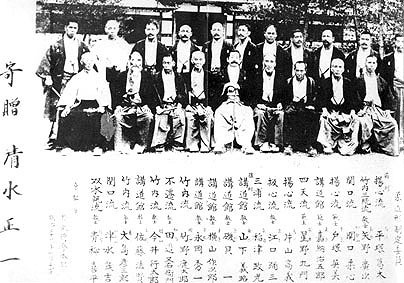 By 1938, the national Diet approved the special committee on the Budo promotion and by 1942, DNBK became literally a part of government organization and it was managed under the direct and joint supervision of ministry of education, ministry of health, ministry of navy, ministry of army and ministry of interior. The headquarters of DNBK located in Heian Shrine was moved to the ministry of health. As a result of this governmental authority, DNBK controlled All Student Soldier Physical Education Promotion Association, Kodokan, Nippon Kobudo Association, All Japan Kendo Federation, and promoted Jukendo, Shagekido (Riflemanship), Kendo, Judo and all Kobudo disciplines for the entire Japan. This organizational transformation exploited by the national political and military groups later became the major factor for DNBK to face its own organizational demise. In 1946, the SCAP CIE and GS of US occupation authority assailed DNBK for militaristic education and forced the organizational dissolution, dismissal, banishment and expulsion of all officers, confiscation of all assets, and abolition of Budo activities. In 1946, after the end of pacific war the GHQ of SCAP (Supreme Commander of the Allied Powers) issued the peremptory directive to dissolve all military related organizations, and subsequently DNBK dissolved its organizational charter voluntarily. GHQ ordered DNBK to be resolved and expelled all officers involved in DNBK activities in 1946. After San Francisco Peace Treaty in 1951, Japan regained her sovereignty. In 1953, present day Dai Nippon Butoku Kai was reestablished with a new charter and the new philosophical vision. Late Hanshi, Kumao Ohno, Hanshi was instrumental in this process while he served as the vice chair, making the society once again a viable force in Budo field. His Excellency, Jigo Higashifushimi, the chief resident-priest of Shorenin Temple in Kyoto, a brother to late Empress Kotaigo of Emperor Hirohito became the chairman of the new society and later recognized as Sosai of DNBK. The new axiom of DNBK stresses preservation of classical martial arts tradition and emphasizes upon restoring the heritage, legacy, and virtues of martial culture and the promotion of education and community service through martial arts training. Zenkoku Butoku Sai (Martial Arts Festival) is held every year in Kyoto Butoku Den on April 29, Showa Emperor's birthday, where hundreds of official members participate in the annual celebration event. In 1965, with Hanshi Ohno's blessing, Hiroyuki Tesshin Hamada as encouraged by his father's spiritual support, brought the traditions of the Dai Nippon Butoku Kai to the east coast VA USA where the first DNBK US Shibu dojo was established in academic setting, which became historically the forerunner of DNBK ID today. In 1972, with the endorsement of the late Hanshi Kumao Ono and the Honbu, the first official division outside Japan was established in Virginia and the east coast USA, and in 1985 they subsequently established the USA division of DNBK after the historic Butoku Sai event in Kyoto. In 1992 the Honbu of DNBK officially established the International Division under the leadership of Tesshin Hamada overseeing all international members. In 1992, the First All America Butoku Sai was held in Old Dominion University, Norfolk Virginia, and the twenty Hanshi and the èlan of martial arts leaders led by Hanshi Fujiwara, then president of DNBK Honbu and Hanshi Miura , VP of DNBK, from the Honbu participated in the finest demonstration of traditional Budo in Virginia USA. In 1994, the first official international martial arts training seminar was held in London, United Kingdom. In 1998, the unprecedented First World Butoku Sai and America Butoku Sai were held in Old Dominion University with over two hundred fifty Black Belts practitioners from ten nations participating in the historic event. The Deputy Sosai, Jiko Higashifushimi, a cousin to Emperor Akihito led the Honbu delegations comprised of twenty-two members led by Hanshi Tsujino, then, president of DNBK board and Hanshi Nakada, VP. The official participants demonstrated the disciplines of Kendo, Jujutsu, Naginata, Jojutsu, Iaido, Sojutsu, Aikido, Karatedo, and Kobudojutsu. The entire procession was conducted in the dignified traditional format as it behooved to the integrity and honor of the premier martial arts society. In 2000, the first UK Butoku Sai was conducted in Manchester England where many Budoka from several nations joined in the coveted DNBK event. Also, in 2001 DNBK International Division held the first Canada Butoku Sai in Burlington Canada and Midwestern USA Seminar, California Seminar and many annual events for promotion of Dai Nippon Butoku Kai spirit. In 2002 the unprecedented The Second World Butoku Sai was held in Butokuden Kyoto Japan in conjunction with 40th All Japan Butoku Sai and 30th anniversary of USA DNBK division and 10th anniversary of International Division. Almost 450 Yudansha gathered in Kyoto to signify the Tour de Force of DNBK and forged the powerful esprit de corps of all members. The event was the authoritative statement of DNBK to the world of Budo that the classical tradition is still the enduring force and their passion for excellence is second to none. In 2004, Youth International Butoku Sai was slated in Kyoto Butokuden with top students from Japan, Canada, and Germany partaking in the auspicious occasion. In the same year, Third All America Butoku Sai was held in Old Dominion University hosting the elite practitioners of Honbu led by Hanshi Nakada and Hanshi Kuwahara and score of top leaders in the classical Bujutsu. It was the largest international event to date by hosting 500 participants in all. It was the first time the youth division was incorporated into the major international Butoku Sai. In 2005, Portugal Rensei Taikai was held in Tenchi Dojo of Sintra Portugal with tremendous enthusiasm of international participation. Also, Spain Budo Seminar was conducted in Madrid Spain. In 2006, France Budo Seminar was conducted in Chartres, France and the First Official Belgium Butoku Sai was conducted in Brussels where top practitioners of the entire Europe gathered for great celebration of Budo spirit. King Albert II sent the special message to this celebratory event. In 2007 DNBK International Division held the First World Youth Butoku Sai with over 300 participants from 7 nations in Norfolk Virginia. Participants partook in the youth peace summit and shared the common views on the global issues of today and the future in addition to the excellent demonstration of Budo skills during the Butoku Sai. They exercised the essence of the sword and pen philosophy to the fullest opportunities. In 2008, The Third World Butoku Sai was held in Kyoto Butokuden with 1100 participants from 35 nations. This was the largest event ever assembled in Japan and the world highlighting the traditional Kobudo and Kobujutsu. DNBK Honbu led by Deputy Sosai, Higashifushimi, Jiko and Honbu board of directors and DNBK ID presided over the entire procession and achieved the optimal success of the event. This major historic event was reported in Kyoto Newspaper and many Budo journals as one of the significant traditional events of the year. In 2008 summer, International Youth Butoku Sai was also held as biannual event to strengthen the youth program where several DNBK ID nations partook in the event. In 2009, DNBK held the annual Japan Butoku Sai in April and DNBK ID held the first tile the Elite Budo Seminar for ten days intensive practice/lecture on Jujutsu, Aikido, Aikijujutsu disciplines in Butokuden where 30 partook from 7 nations. In 2009, Honbu and DNBK ID held the International Rensei Taikai in Athens Greece in conjunction with 110th anniversary of Greco-Japan relation. Ambassador Kitamura from Japan partook in the official capacity and honored the auspicious occasion. Honbu delegation was led by Hanshi Kuwahara, president of DNBK board of directors. In 2010 July, youth members from US, UK, France and Canada partook in the Japan Youth Butoku Sai. They showed outstanding spirit together. In the same year, 21 elite members from Russia, US, Canada joined in the challenging Summer Elite Budo Seminar where they were able to learn more than seven different traditional Ryu Ha directly from more than thirty high ranking instructors of Honbu. They also performed outstanding skills and spirit at Nagoya Castle by representing DNBK ID as a major force. In November of 2010, Fourth America Butoku Sai and Commemorative Gasshuku was held in Virginia Beach Ocean front. More than five hundred participants attended in the special event in conjunction with 45th anniversary of DNBK US Shibu dojo in the USA. Hanshi Kuwahara from Honbu DNBK attended the special occasion. In May, 2011, DNBK ID of the entire world campaigned rigorously for humanitarian effort to help the cause of Japan Tsunami and Earthquake disaster. In July, 2011, Canada Butoku Sai and Second World Youth Butoku Sai took place in Queens University, Kingston, Ontario Canada. Over three hundred participants enjoyed the major international Budo celebration. During the fest event, delegations partook in the major tree planting ceremony of Kuwahara Sakura Tree Promenade in Kingston city. Honbu dispatched over sixty delegation members to Canada. Hanshi Tallack and Canada team leaders made significant contributions to ensure the success of this Taikai, while mayor of Kingston attended this important event. Kyoto Elite Budo Seminar for Iaido and Kendo was also conducted in June, 2011. In 2012 April, Fourth World Butoku Sai in conjunction with fiftieth Japan Butoku Sai was held in Butokuden Japan. In commemoration of this glorious occasion, tree planting ceremony and dedication of memorial stones were observed at the Butokuden court for the first time in DNBK history. Total of 650 Budo trainees from 17 nations partook in the grand scale of majestic events where many celebratory spirits were exchanged. In the same year, after 60 years of DNBK operation since 1952, it became once again the General Corporation sanctioned by the Japanese National Government. Since 2009, elite Budo seminars were held every summer period in Butokuden and Honbu DNBK offered the training seminars for DNBK ID members who wished to pursue the advanced level of traditional Budo and Bujutsu. In 2013, United Kingdom Butoku Sai was held in London and participants from ten nations partook in the prestigious event where they demonstrated their outstanding skills and spirit. From Honbu DNBK, Hanshi Kuwahara, president of DNBK led the Japanese team of adult and youth of over 50 participants. UK Shibu led by Shihan Payne and his teams were instrumental to achieve one of the finest international events and the participants enjoyed the tree planting ceremony of 111 cherry trees at the National Bedgebury Park in commemoration of UK-Japan 111th anniversary of Anglo-Japan alliance. In 2015, on the occasion of fiftieth anniversary of US DNBK Bushin Kan, commemorative Fifth America Butoku Sai and Gasshuku is held in Virginia Beach VA USA where nearly five hundred participants from ten nations joined in the landmark celebration event. In this signature year, The Peace Monument of ancient boulders and stone-park is dedicated in the municipal park of Virginia Beach City for world peace, safety and prosperity for all nations and people on this globe. The Peace garden is dedicated in the city of Norfolk MacArthur Memorial in honor of Mrs. Jean MacArthur, wife of General MacArthur for her extensive contributions to the world peace. In 2016 April 29, Fifth World Butoku Sai was held in Kyoto Japan with over 600 participants from twenty nations worldwide. Imperial Princess Akiko of Mikasa from the Imperial House of Japan attended the opening ceremony and gave her keynote address to the entire participants. Her Imperial Highness attended the WBS in Butokuden for the first time in the history of DNBK. For the first time, all international delegates were requested for the official messages given by major leaders of each nation to this event. President Barack Obama of the USA White House and many other international dignitaries provided the official and special messages. In addition, special dedication of Budo by DNBK ID leaders was conducted in the Taisho Butokuden of Seiryuden. The Commemorative International Rensei Taikai was also staged in Butokuden April 30. In 2017 August 5, in Clermont-Ferrand France, the France Butoku Sai and International Youth Butoku Sai was held in commemoration of 110th anniversary of Franco-Japan treaty and 159th anniversary of Franco-Japan Commerce, Trade and Amity Treaty. The special Japanese Sakura Park for Peace and Stone Monument was dedicated in the city park. Honbu delegations led by Tesshin Hamada and Yutaka Takeda attended while the Mayor of Clermont-Ferrand presided over the ceremonial occasion. Hanshi, Andre Cognard and France Shibu members as well as many attending DNBK ID leaders made significant contributions to this celebratory event held in France. Over 500 DNBK ID members from 15 nations partook in the auspicious France Butoku Sai. In 2020 during the year of Tokyo Olympics, 6th World Butoku Sai will be held in Kyoto in commemoration of 125th anniversary of DNBK. It is expected over one thousand men of high caliber Budo artists across the globe shall attend in the major historic celebrations. At present time in DNBK Honbu organization, Honorable Resident-Priest of Shorenin Temple, Jiko Higashifushimi who is cousin to Emperor Akihito of Japan, is serving as Sosai of DNBK and Hanshi, Masakatsu Tsujino, 9th Dan Kendo is serving as the advising counselor of the board and Hanshi, Takemichi Kuwahara, 10th Dan Jujutsu is serving as the Deputy Sosai of DNBK and Hanshi Tesshin Hamada is serving as the president of DNBK board of directors of Honbu in Kyoto, leading the administrative operation of the Honbu organization, while Hanshi Takeda, Hanshi Yamamoto, Kyoshi Watanabe, Kyoshi Uemura, are serving as board directors of Honbu and Hanshi Fujii and Kyoshi Nakada are serving as controller of DNBK. Tesshin Hamada Hanshi, founder of DNBK ID serves as the chair of DNBK ID while Kimberly Baylor, Kyoshi serves as the executive secretariat of that office. In the International Division as of 2018, we have official representatives and coordinators in Canada, United Kingdom, Italy, Belgium, Portugal, Israel, Hungary, Russia, Germany, Spain, Malta, France and California USA, Hawaii USA, Mid-Western USA, Boston USA, Florida USA, Australia, Romania, Switzerland, Armenia, Chile, Switzerland, Greece, Gibraltar, Austria, and other prospective international locations while several thousand members registered in 45 nations. In DNBK ID, there are highly well-respected international leaders as national representatives, coordinators, Kenshoin and dojo heads in each prospective geographical zones. The DNBK ID intends to develop broader representations worldwide in the future. The society aims not only to preserve classical traditions and legacies of Japanese Budo and Bujutsu but also to foster greater international understanding, goodwill, mutual understanding and promote world peace and harmony through martial arts training, education and relevant exchanges.